The La’Angum Learning Center opened in September 2008 with 40 children in a pre-Kindergarten class, and a new grade was added in each succeeding year. There currently are 208 students in pre-Kindergarten through Grade 5, and the student retention rate is 100%. The objective is to create a proven model of high quality primary school education, covering all classes from pre-kindergarten to primary 6 over an eight-year period. 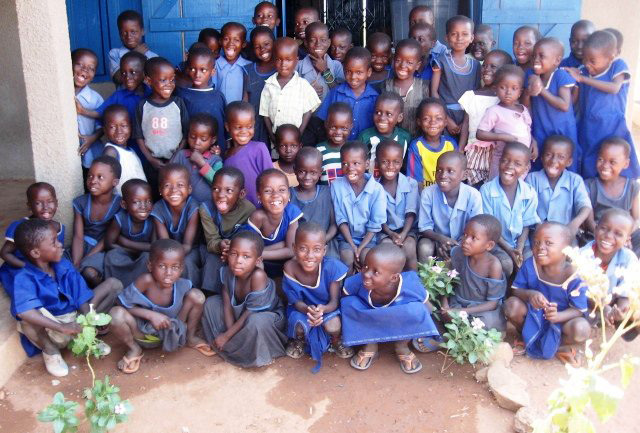 Since 2008, PAMBE Ghana has invested significantly in building infrastructure, including 8 classrooms, a library, a computer lab and a kitchen. Computers powered by solar panels were donated by the Rotary Clubs of Watford and Wainright, Canada. Rainwater harvesting systems collect water, which is stored in three 40,000L tanks. Together with latrines, the water is essential for sanitation and health. PAMBE Ghana also has invested in teacher training via various resources. La’Angum Learning Center teachers continue to receive training in Montessori methods through visiting trainers and at Ghana Montessori International in Accra. PAMBE Ghana provides teachers with the opportunity to fulfill their university-level basic education degrees, Montessori training and certification. In return, these trained professionals commit to a term of service, which ensures that students receive quality as well as continuity, despite their remote location. In collaboration with the Ghana Institute of Linguistics, PAMBE Ghana published the first primary readers in the Mampruli language, enabling students to begin formal education in their own, familiar tongue. Just as the La’Angum Learning Center has been integral to the communities it serves, these communities have been important to the school. In 2007-08, when the school was founded, locals took primary responsibility to clear the land and build the initial structures, and in fact chose the name for the school – the phrase ‘La’angum ka toom’ meaning teamwork, or many hands make light work. As the school has grown to its present size of 249 students, 13 teachers, and 3 administrators, the local communities have continued to assist in many ways, including building and maintaining the physical structures, and the collaborative model in support of education continues to flourish. In 2014, a local School Management Committee (“SMC”) was formed to provide oversight and make recommendations concerning long-term planning, in accordance with the governance practices of the Ghanaian Education Service (“GES”). In addition to Alice, this diverse committee is composed of the PTA chair, the head teacher, the local assembly person, and a representative from the GES, as well as representatives designated by the local chief, the Imam, and the local Catholic group. The SMC includes both male and female representatives. The creation of the SMC reflects the maturation of the school from a seed planted by Alice into an institution whose roots have taken hold.